Nobel Prizes, in their respective field, are awarded annually to those that have made the most important discovery or improvement. Some might consider the winners of Nobel Prizes to be controversial, especially the German chemist Fritz Haber who was awarded the prize in 1918 for his work in synthesising ammonia. Today, the process is known as the Haber-Bosch process and is generally used for the production of fertilisers. The story of Haber and the development of synthetic fertilisers raise ethical questions on the impact of Haber’s work on society, the environment and the horrors of both world wars. Considering this should Fritz Haber have been honoured with the Nobel Prize? The Haber process is used today primarily for the manufacture of ammonia to produce fertilisers. However, it is widely disputed that fertiliser production was his intended use for ammonia. Another use for the process is the production of nitric acid, a precursor to many explosives. Many suggest, as a German nationalist, this was Haber’s real intent. The use of these explosives was thought to have extended the First World War by up to 3 years, causing thousands more deaths. The theories of Kantism suggest that it is not the consequence of the action that should be judged but the intention of the person causing the action. If the creation of the Haber-Bosch process is taken into isolation it can be hard to determine the intentions of Fritz Haber and thus it becomes ethically complex. 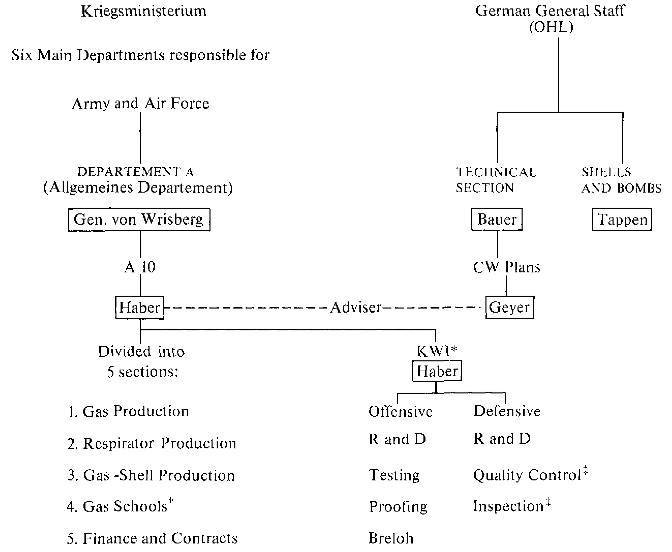 Further investigation into Fritz Haber’s intentions could be assumed to be more nefarious, as Haber had a key role in chemical weapon production as seen in Figure 1. In 1915, supervised by Haber, the German army released 498 tonnes of gas onto the battlefield, causing the horrific death and injury of 10,000 soldiers. This was then followed by another invention of Haber; the even more deadly mustard gas. At the time, it was thought by some to be unethical due to the suffering caused by this weapon; with it even being described as “…repulsive. Immoral. Monstrous” by some generals. As aforementioned, Fritz Haber had employed his intellect to synthesise chemical weapons meaning that he has been unethical from a Virtue standpoint. As a result of this, he may have had the intention to utilise the Zyklon B gas that was produced directly following his research in 1923 for negative reasons. After his death, this compound was used within the gas chambers at the extermination camps to perform approximately 1 million killings during the Holocaust. Thus from a utilitarian standpoint, this was extremely unethical as his actions of synthesising this pesticide allowed for the development of one of the most infamous chemical weapons. The birth of the Industrial Revolution drastically improved advances in medicine and living standards. Naturally, the global population exploded and after only 100 years of the revolution kick starting, the population grew by 100 %. In order to accommodate the population growth and the number of mouths to feed a solution was required. The natural way in which plants grow is via the nitrogen cycle. The nitrogen cycle is effective but was not fast enough to accommodate the increasing demand for crops. Thus, the race began to find a solution to nitrogenise crops in order to increase the productivity of agricultural land. Fritz Haber had the solution by developing a method of directly synthesizing ammonia from hydrogen and nitrogen. The fertilizers, in conjunction with pesticides, were able to quadruple the capacity of agricultural land. It is estimated today, that half the food that is consumed globally is grown using fertilizer from the Haber process. Haber’s creation has been described as ‘the reaction that changed the world’ and Haber himself, as the man who had given ‘the greatest benefit to mankind’. One could argue that the development of the Haber process has negatively impacted the environment due to intensive fossil fuel consumption leading to greenhouse gas production. However, from a utilitarianism point of view, the argument can be virtually overthrown. In the time of need, a solution was required to feed an increasing population thus the development of the Haber process was the morally right action that produced the most good for the most amount of people. The success of ammonia synthesis made Haber a national hero. On the onset of 1914 when World War 1 swept across the continent, every country in Europe joined the forces against Germany and Austria. The German military was totally devastated by the modern warfare used by their counter forces. The use of machine guns made their old-fashioned marching tactics completely irrelevant and within 2 months, there were more Germans killed than in every single German war combined. The death rate was so staggering that the entire German nation could have been annihilated if Haber had not developed chemical weapons to save his nation. It can be argued on the basis of Deontological (duty-based) ethics that it was the duty of Haber to develop such weapons and save his nation from losing the war and his people from dying. He believed that “During peacetime, a scientist belongs to the world, but during wartime, he belongs to his country”. If Haber refused to develop these chemical weapons, he would have been morally responsible for all the men who would have died because of his inaction. The story of Haber’s mustard gas creation has a brighter end. Further studies and developments with Mustard gas were found to stop the growth of tumours and the discovery laid the basis of cancer treatment-chemotherapy. The gas which took millions of lives during the period of war is now used to treat some of the cancers today and has the potential to save millions of lives in the future. The group believes that it was ethical to award Fritz Haber the Nobel Prize. Although you argue that developing chemical weapons saved lives German lives in the war, which may be true, this does still not account for how inhumanely mustard gas would kill the enemy soldiers. Developing such a weapon with understanding of the damage it could does not deserve a nobel prize in my opinion. Furthermore, although there has been some medical success from the gas, this was not the intention of its conception, so does not absolve Haber in any way. Just like a coin his research has two aspects… And it’s upto us how we look towards it. Most of the developments in science and engineering that have taken place in modern time have been accelerated during times of war or because of selfish motives in the modern era and hence i agree with the given verdict! Haber was awarded the Nobel Prize in 1918 for his work on ammonia synthesis. The process he developed – now known as the Haber process – fixes nitrogen from the air to make ammonia, which can be used to make synthetic fertilisers. However, some scientists have argued that Haber should never have been awarded the Nobel Prize. Generally the standards of scientfic ethics do not hold scientists responsible for the uses governments and others make of scientific inventions. Scientists who helped invent the atomic bomb and later more powerful weapons received their share of Nobel Prizes. I agree with the those who say that if scientific ethical standards held scientists to account for other people’s use of their discoveries, then soon so would legal standards and there wouldn’t be a lot of great science making discoveries for good or ill.
As it was rightly said in the article that his contribution led to many of the consequences which were favorable for his nation. No doubt that he was a true nationalist and wanted to serve his nation during the warfare and it is also accepted that his invention brought a revolutionary change in whole agricultural and medical sector which must be acknowledged and rewarded… but when it comes to the debate whether to give him Nobel prize or not I think it should be a clear #No… as Nobel prize is given in various categories one of which is Nobel peace prize given to person trying for global peace. so I think it becomes contradictory that under same title you are giving prize to a person who had the major role in devastating innocent lives and we cant ignore the ill effects of chemical weapons and environmental implications of his invention. Was Haber awarded the Nobel Prize for all of the research he performed or was it just for the Haber process that resulted in an increase in fertilisers? I suspect the latter, therefore the decision was justified. Unpleasant people can do pleasant things, just as pleasant people can sometimes be unpleasant. In this particular case, I think we are judging a person’s action not the person.